posted: January 05, 2016 by: Dr. Marty Becker, DVM Tags: "Clinic Specials" "News"
I was born and raised in Idaho, I live there still, and I know cold. I grew up a dairyman’s son on a classic American farm, and there’s nothing a farmer knows like the weather because there’s no day a farmer isn’t out in it. As a veteran veterinarian (more than 30 years in practice), I also know the toll winter’s worst can take on our pets, especially the old or the chronically ill. As winter’s worst does its best to make us all miserable, it’s essential to be sure our animals are as warm and safe as they possibly can be. That starts, of course, by working with your veterinarian to make sure your pets are in good health, because a body that's working well is better able to stand the strain of extreme weather. After that, it’s up to you to protect them. Here are some tips on exactly how to do that. The best place for pets to live is indoors, as part of your family. When I was growing up, our farm dog never came in the house until I begged my dad to let him come in during a blizzard. At that point, our dog became part of the Great Migration, from the barnyard to the backyard to the kitchen to the bedroom to the bed. While the farm dogs of my childhood always had a warm, well-insulated place to live, it’s no surprise that now my dogs share my bed like so many others do, probably yours. 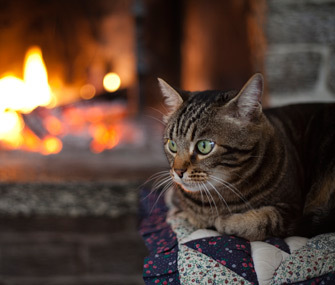 For dogs and cats both, the best way to keep them warm and safe is to keep them inside. Of course, I do realize that some people don’t keep their pets indoors, and if that’s your situation you need to make sure your pet has shelter that not only protects him from the elements but is also well insulated and small enough to help him retain his body heat. Even better: Get a pet-safe heating element made for use outside, and always put a blanket or towel between the element and your dog to reduce the chance of skin burns. You’ll need one for the water dish too, because pets always need access to fresh water. On the dog, not on you. No, it’s not crazy. Some dogs really can use some help staying warm. Tiny dogs, light-coated ones and breeds with thin body types, such as greyhounds and whippets, struggle to stay warm, and can use a sweater in cold weather all their lives. Older dogs and sick ones can also benefit from the boost a sweater or jacket provides. Our two small dogs, Quixote and Quora, love snuggling in their PJs on cold winter nights. Bonus: Canine sweaters keep the shedding down, and that, along with rotating the sweaters so your dog’s always in a clean one, helps make it easier to keep the house neat and your dog huggable. Even if your pet shares your bed at night, he should always have access to a pet bed. While almost all dogs and cats appreciate them, older pets really need beds to help protect aging joints. Look for beds with lots of cushioning and “give” so pets can sink into the bedding yet not hit the ground. Egg-crate or memory-foam beds are ideal, and many pets love styles that have raised edges for a pillow effect. Cats, especially, seem to like these cup styles. If your pet seems to need a little extra warmth, you can buy a bed that is heated, or add a pet-safe heating element. Avoid electrical heating elements if your pet is a chewer or has some incontinence — consult your veterinarian for advice on how to find a heated bed that's safe for your pet. Keep the fur between your dog’s toes clipped short to discourage the build-up of snowballs between the pads, and rub a little petroleum jelly on the pads for protection before you go out. When your pet comes in, especially from walking on areas treated with de-icers, wash and dry his paws. It’s actually pretty easy to teach your dog to wait on a mat and lift each paw for cleaning, and he won’t mind if he's rewarded with treats and praise. Keep your paw-cleaning supplies nearby for convenience. You can make things even easier by putting boots on your dog for urban paw protection. Check paws regularly for dry, cracked pads, and treat with a moisturizer like Bag Balm. If the paws don’t look better within a few days, talk to your veterinarian; there may be something more serious going on than a simple cold-weather problem. Keep your dog and yourself out of trouble by keeping your pet on a leash. You’ll want to make sure to keep your pet from drinking from any puddles or eating any slush that is possibly contaminated with de-icers. You’ll also want to keep your dog away from deadly hazards such as thin ice, or from the risk of being hit by a car whose driver can’t see as well in lower light or bad weather or can't stop in time because of an icy road. While cold, ice and snow are the hazards everyone thinks about at this time of year, there are also dangers inside, and while most aren’t season-specific (such as Xylitol, toxic foods and medications), some, such as lilies, are. Make sure you keep cupboard doors and drawers closed and dangerous materials inside them. Check your house plants against a list of toxic greenery, and make sure you’re using pet-friendly cleaning and pest-control products carefully and per directions. I’ll soon be back home in Idaho enjoying the beauty of our snow-covered pastures, but the seasons will be changing soon, and with each new weather pattern comes a different set of warnings designed to help you keep your pets safe. Remember that your veterinarians — and trusted, veterinary-approved websites like this one — are your best guide to keeping your pets comfortable and healthy, no matter what the season!